Ran out just before sundown to snap photos of my latest FOs, which are both white. I never knit white. A treat for the eyes. First up, Clapo-ktus. Which I call Clocktopus because that makes way more sense. I like Clapo-ktus. I feel kind of dumb, though, because I was quite a long way into it before I realized that, although the pattern is a mashup of Clapotis and Backtus, two great tastes that taste great together, it lacks one of my favorite features of Clapotis, in that it’s not knit on the bias. I like the slinky, snaky character of bias fabrics. This doesn’t have that. I also over-shot it by a quarter skein of Handmaiden Sea Silk. 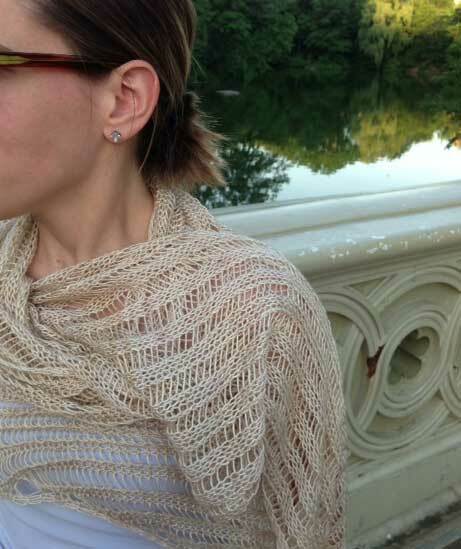 One skein would have been a luxuriant scarfy wrap, which is how I intend to wear it. But that is not to detract from Clapo-ktus. I like it a lot and will wear it a lot. Perfect summer accessory for a woman who spends a lot of time in over-conditioned office air and tries not to leave the house without a flowy, loopy divertissement in the region of the neck. Next up: my two precious skeins of Lot 1 from Clara Parkes’ Great White Bale club. This is mule-spun merino wool. It does not seem like wool. It’s cottony, airy. Marshmallow merino. I couldn’t wait to knit it up. 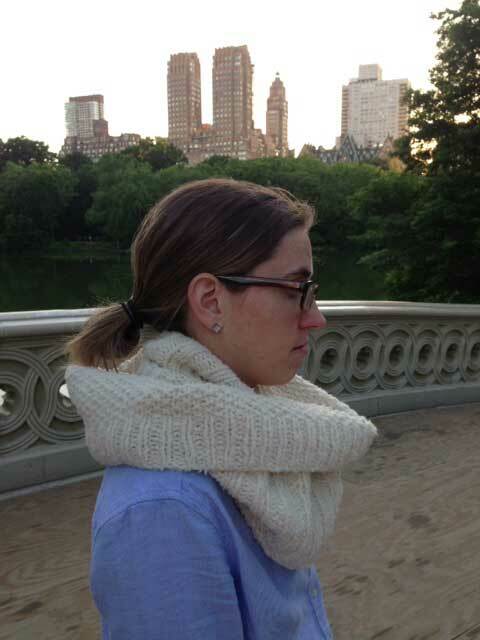 I chose to make a longer version (180 stitches cast on) of Jane Cochran’s simple cowl, Thirty-eight. I improvised a little because I was using two skeins instead of one, and I felt like it. You can’t go wrong with this style of cowl, in my opinion, as long as you stick to texture patterns and a fairly loose fabric. I’m not knitting anything on the subway right now. WHAT. I know! What’s wrong? 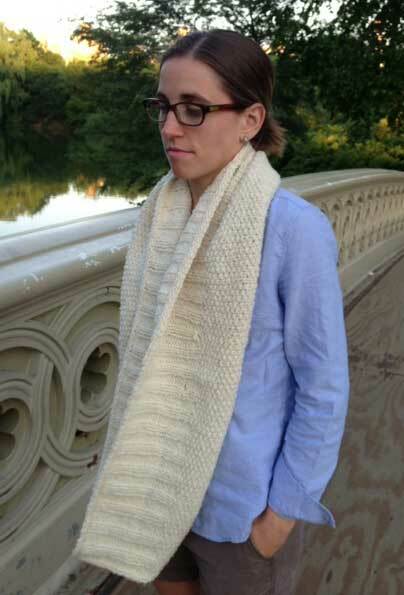 I keep trying, on a linen cowl, and I’m finding that linen and the subway are just not working. The yarn slips off the needles and stitches drop down several rows and it’s just frustrating. These problems have solutions, I know, but subway knitting is not about solving problems, it’s about jamming a wad of knitting back in your tote bag so you can change trains at 34th Street. OK, 15 minutes are long gone. Loading pictures onto this ol’ blog reminds me of Clara’s spinning mule. Wow, the white color and both items are gorgeous. I especially like the Clapto… Clapo….bupkis something. Hey, big sister, what have you done? I’m finally finishing the Erika Knight Deep V-Neck (in black discontinued Debbie Bliss Cathay) the pieces of which have been complete for over four years. Why now? Chissa? Kay, I love love love your ‘clocktopus’. I received a gorgeous skein of Sea Silk in Charcoal in the mail yesterday from EatSleepKnit. What a luxurious yarn, I can’t wait to get started on this pattern. Thanks, as always, for your inspiration! I love these. I am going to have to look up the pattern and look through my (endless) stash for something to do it justice. 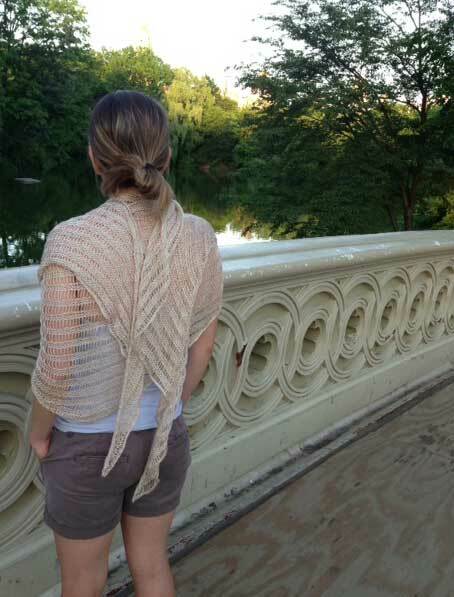 I love this first shawl. I just peeked at Ravelry, and now I’m going over to download, and dig through the stash. Thanks for sharing. The second would work here today – it is COLD in Toronto. I have the furnace on, in June…. Oh yeah, I’ve been working on a linen lace scarf. Yarnovers in linen on teeny needles. Not subway or meeting knitting at all. Thanks for the Billy Idol earworm. Both are absolutely beautiful! Sounds like the “real job” has added a new component to your subway knitting. No leisurely schlep to the yankees stadium this! I’ll have to check out the mule spun merino. So there I was, tooling along, smiling and marveling at your pictures and the gorgeous shawl, and then… hey! That yarn looks familiar! That cowl looks cowltastic. 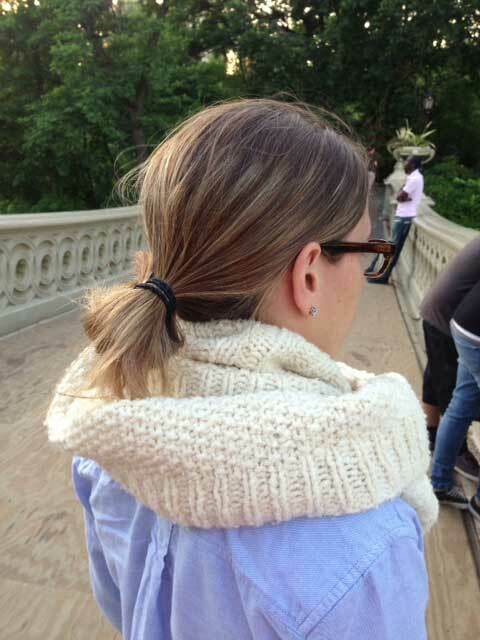 A cowl for all storms past, present, and future. No cold winter wind will pass through that fabric. It’s like…a sleeping bag for the neck. Love, love, love. I love the Clapotis, it looks stunning in the white. ugh the ear worm. Love you anyway. ps I wish I would make myself knit in white, or off-white, it would be lovely to wear either one of these pieces. Aside from always forgetting to acquire white yarn, I would surely spill coffee on it before completion. Pre-stained handknits are an asset in no one’s wardrobe. I met someone who used to live with Billy Idol back in the day. She was great fun and I was awestruck. Obvs this was via P&J. Lovely knitting, by the way (!). Springtime in New York! How lucky are you. Adding my thanks for the earworm. Knit on the subway? In white? Nah, you’d get it all grubby. Or am I showing my age, and my high school commute on the 1 train in the 1970s, when the grit level was a lot higher? Anyway, subway knitting is for something small and scrunchable, like the newspaper. Love the white knits, especially Clocktropolis! Loving knitting w/ GWB. What size neddles did you use? 10? Excellent advice. For me, short-trip-travel knitting means garter, stockinette, and maybe (MAYBE! )a couple of repeats of feather and fan. Oops, sorry, Amtrak wifi strikes again! So pale! Love it. And Stephanie, I’m with you: I’m stockpiling all the Great White Baleness into one juicy project, tba. I would even include that tube of roving or whatever the hell it is except that my cats think it is alive and keep trying to eat it, with comical lip-smacky results. So pale! Love it.–NO, WAIT! That’ s a different post, but I do very much like the creamy and delicate look of your freshly knitted white lovlies. Thanks, also, to niece Kristen for her patient poses. With regard to the perfect subway knitting, I’m thinking crochet grannie squares (or other geometric shape). They are so versitle in. color, approach to construction, etc., are quite portable, and the imagination is the only limit (of course, unless one cannot imagine ever doing that, then the imagination must rustle up some thing. new to excite the desire that burns within…. OK, ‘nuf said. Loved the 15 minutes. Hope work went well today. I love reading your blog, all your finished products are amazing! I especially love the cowl. Whoa! That Thirty-Eight is magnificent!